STEMCELL Technologies is committed to getting the most out of your cell culture systems. Our standardization tools include Proficiency Testing programs, Quality Control Kits, and other instructional materials to improve your competency with performing the hematopoietic colony forming unit (CFU) assay. 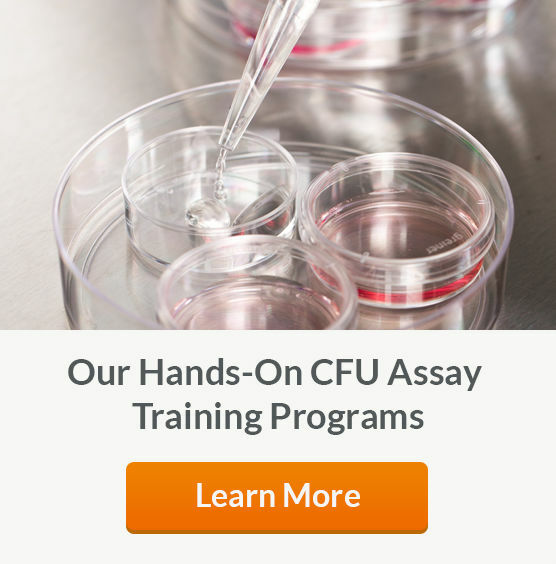 Evaluate your ability to perform all steps of the CFU assay including upstream events such as cell thawing, dilution, inoculation and plating through our Proficiency Testing programs. Participants are provided with a cell sample, MethoCult™ medium, additional reagents and supplies, and detailed instructions required to perform the CFU assay. The results from all participants are analyzed and compared to the cohort mean according to guidelines outlined in ISO 13528. Why Use Our Proficiency Testing Programs? GLOBAL PARTICIPATION. Compare your progenitor counts to other centers worldwide. COMPREHENSIVE REPORT. Cohort data is represented with dot plots and histograms. IMPROVEMENT PROGRAMS. Identify areas that may benefit from continued education and training. Gordon MY. Blood Rev 7: 190-197, 1993. Page KM, et al. Biol Blood Marrow Transplant 17: 1362-1374, 2011. Hogge DE, et al. Bone Marrow Transpl 25: 589-598, 2000. Sutherland R, et al. Stem Cells 11 (Suppl 3): 50, 1993. Burger SR, et al. Transfusion 39: 451-456, 1999. Lumley MA, et al. Br J Haematol 97: 481-484, 1997. STEMCELL Quality Control Kits are recommended for cell processing laboratories that monitor their ability to reproducibly set up, culture and score hematopoietic colony forming unit (CFU) assays. The kit contains standardized MethoCult™ medium, pre-tested human cells from either bone marrow or cord blood, and culture supplies to perform monthly CFU assays over a one-year period. Detailed instructions on the setup of the CFU assay and scoring of hematopoietic colonies (CFU-E, BFU-E, CFU-GM and CFU-GEMM) are also included. The use of a standardized medium and identical aliquots of cells from a single source minimizes variability associated with the components of the CFU assay, allowing you to monitor a laboratory's consistency in performing the assay. Quality control kit for hematopoietic CFU assays using human bone marrow samples. Quality control kit for hematopoietic CFU assays using frozen cord blood samples. STEMCELL Technologies provides a number of training tools, including atlases to help you identify and evaluate colonies derived from hematopoietic progenitor cells, and detailed protocols for the culture of specialized cell types. The perfect hematopoietic stem cell laboratory tool to guide you through the process of identifying and evaluating colonies derived from human hematopoietic progenitor cells grown in different methylcellulose-based formulations. Over 160 photographs are accompanied by instructions and guidelines for identifying CFU-E, BFU-E, CFU-GEMM, CFU-GM, CFU-G and CFU-M. This atlas provides detailed color images of hematopoietic colonies derived from human umbilical CB progenitors grown in methylcellulose-based cultures. Instructions and tips for identifying and enumerating colonies from both fresh and frozen samples are included. Also addressed are issues related to red blood cell background and optimal plating densities. This atlas provides instructions for culturing and identifying colonies derived from human hematopoietic progenitor cells in methylcellulose-based media. The morphology of colonies from healthy individuals and patients with hematological disorders is illustrated in 230 detailed color photographs. A practical and concise guide to the use of precursor cell cultures as a complementary tool for the diagnosis and follow-up of hematological stem cell disorders.